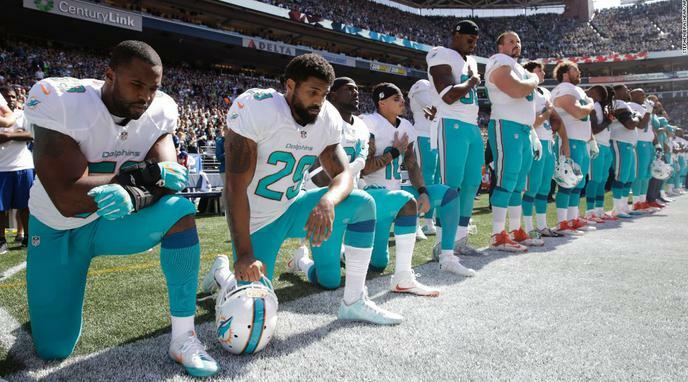 Players should be free to partake in respectful protests, including kneeling. Kneeling during the national anthem is a form of protest and there isn't any protest criteria that requires the opposing side to feel comfortable with 1) what is being protested 2) in what form the protest takes. Players should continue to be allowed to kneel. rule stating that the club will be fined if a player kneels. This means the owners are going to pay fines for passing this un-American rule, and not the players. Kneel away. The NFL is a private business and kneeling subjects that business to an unrelated political morass. It has a negative effect on public relations by virtue of creating and perpetuating a political argument that damages the NFL no matter how it responds. It is bad to force one's employer to pay an unnecessary and unwanted cost to promote an arbitrary cause of your own choosing. Racial equality is subjective. There is no definitive stance on when folks would move from 'kneel' to 'stand', as there is unlikely to ever be a consensus of when racial inequality is 'fixed'. It is hypocritical of owners to kneel in response to Trump's comments about the protest but to have also taken no stance on his previous controversial statements.